How to connect video out on Home Cinema System (HT-TZ325) to Samsung TV? Connect the HDMI cable (not supplied) from the HDMI OUT jack on the back of the DVD Home Theater to the HDMI IN jack on your TV. HDMI enables you to view movies in High definition on your HDTV. 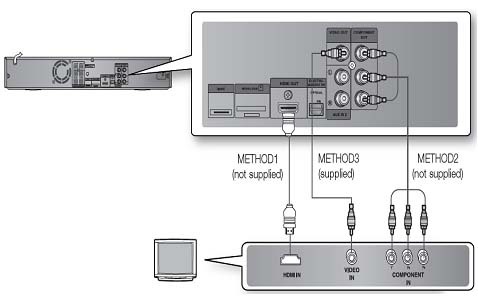 If your television is equipped with Component Video inputs, connect a component video cable (not supplied) from the Component Video Output (Pr, Pb and Y) Connectors on the back of the main unit to the Component Video Input Connectors on your TV. Connect the supplied video cable from the VIDEO OUT jack on the back of the main unit to the VIDEO IN jack on your TV.